For some reason, all our July posts so far have a decidedly "Latin" feel to them. Welcome to eatingclub Julio Latino ("Latin July")! I had to throw in that Taiwanese Stewed Minced Pork post for a little variety. 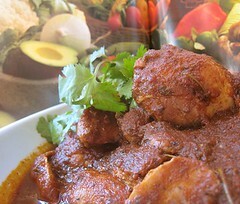 Here's yet another "Latin" dish; it's a Mexican dish inspired by Mexico: The Beautiful Cookbook. I've been flipping through this book, wanting to make something. However, some people in the house have an aversion to cumin. (Didn't we mention we cook for picky people?) As you can imagine, trying to find a cumin-less dish in a Mexican cookbook can be a little challenging. But, here's one! 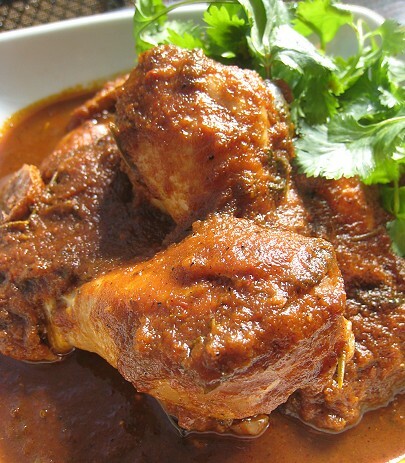 In the book, the dish is called Pollo a las Hierbas de la Sierra (Chicken with Mountain Herbs). However, the recipe called for avocado leaves. It's certainly the first time I've heard of avocado leaves being used for cooking something. Needless to say, we did not have avocado leaves in the house. 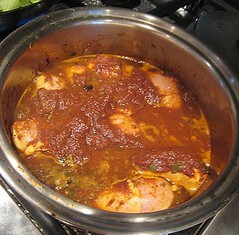 So, I did my best and came up with what I'm calling "Ancho Guajillo Chicken" instead. I've made a few changes to the recipe, but I'm copying the original at the end of the post. Here is how that concoction in the blender came to be. I toasted the anchos and guajillos in a dry pan first, then removed the seeds and membrane. Back into the pot they went, along with chopped tomatoes. They cooked until softened. They went into the blender with some garlic, onion, and some plain old white vinegar. The resulting purée went onto some chicken that have been seasoned with salt and pepper. We only had drumsticks, so that's what I used. They sat marinating for about 20 minutes or so. Um, yeah. Be it known that it seemed like I did not actually have any of these hierbas on hand; fresh ones, that is. I made the herb infusion using dried Mexican oregano (at least I got the Mexican part correct!) and some dried rosemary (all the way from the Provence! Thanks again, Dhanggit!). No avocado leaves, kids, sorry. 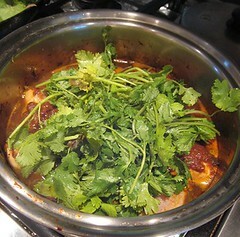 The dried herbs steeped in some boiling water. 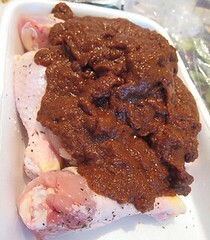 I then added the chicken and marinade. To add the "bulk" that was supposed to be provided by the avocado leaves, I used cilantro instead. We do love our cilantro, after all, and cilantro is still "Mexican", right? Right? This simply simmered away until the chicken was cooked. I wasn't sure how the chicken would taste, given my limited experience with these red chiles. I was a little surprised that the chicken tasted quite familiar. The chicken was juicy and fall-off-the-bone tender. 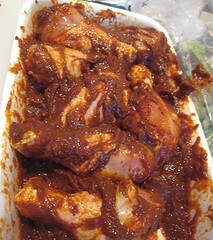 The overall taste of the sauce is quite complex, enveloping the chicken in a kind of rich, smoky, earthy sweetness. It was quite delicious, albeit a little difficult to parse right now. We have to go on a chile education -- and perhaps Julio Latino is the month to do that. 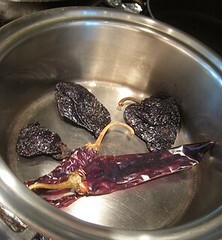 Toast the chiles and remove their seeds and membranes. 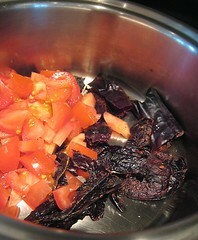 In a small saucepan, cook the chiles with the tomato over medium heat until softened. 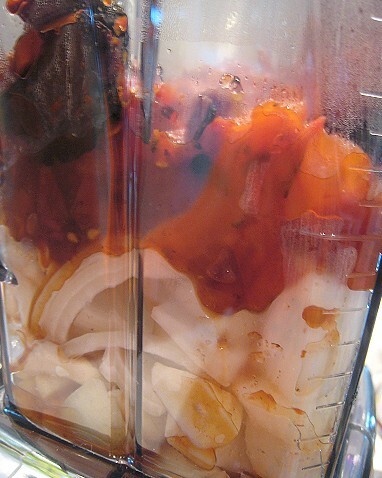 Transfer to a blender, add the garlic, onion and vinegar and purée. Coat the chicken pieces with this purée and let marinate at room temperature for 20 minutes. Bring the water to a boil. 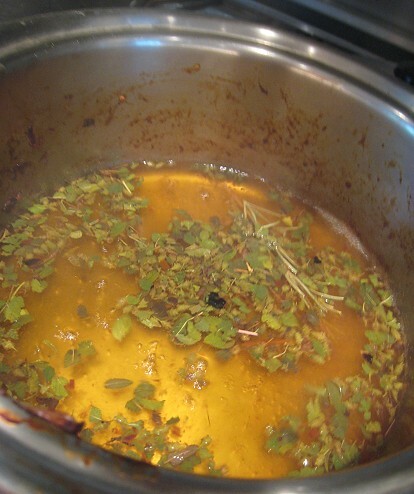 In a deep cazuela or pot, prepare an infusion by pouring the water over half of the herbs. Add the chicken and cover with the other half of the herbs. Cook over low heat, covered, for 40 minutes. 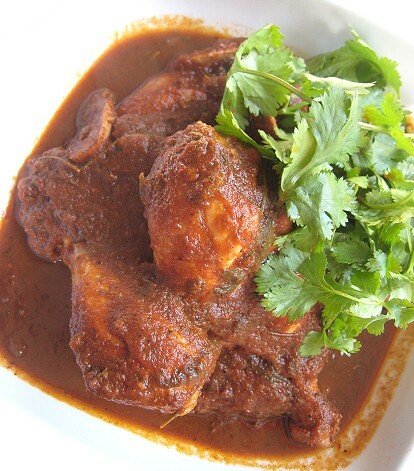 When the chicken is tender, serve it on the leaves with which it cooked. That puree looks just fabulous! I love the complex, almost smoky flavor of the ancho chile. I always wonder why I don't seek them out more often! 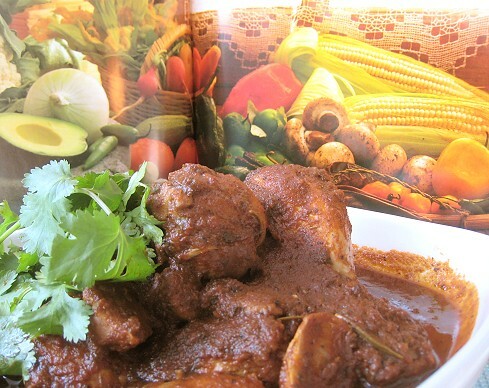 This dish is giving me a craving for some good old fashioned Mexican cuisine, that's for sure. Mmmmm looks delicious. I guess you guys are having an unusually cool summer too? Hahaha, I know! Actually, we don't know of a Latin American grocery store here... at least, we don't know if any yet. Perhaps they will have it? But it does sound like a very rare ingredient! The summer here has been very weird so far. There'll be a few days (almost a week) of hot weather, then there'll be a week of almost "cold", wet weather. Then, back to the hot. It's very confusing.